Title Vikings / by Mary Pope Osborne and Natalie Pope Boyce ; illustrated by Carlo Molinari. 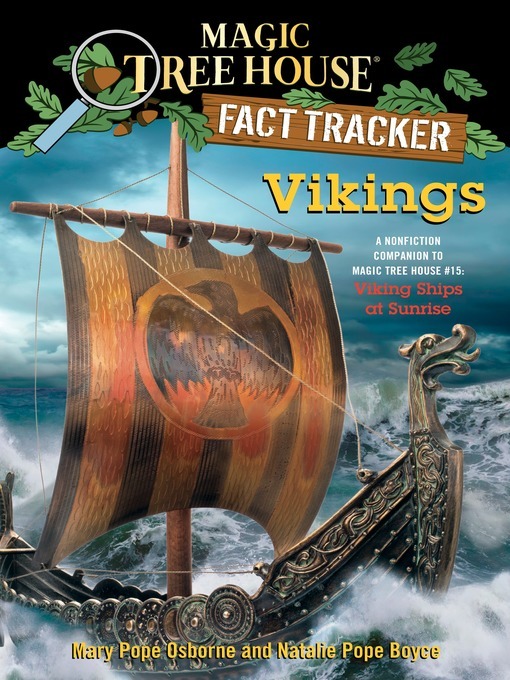 Note "A nonfiction companion to Magic Tree House #15: Viking Ships at Sunrise." Summary When Jack and Annie came back from their adventure in Magic Tree House #15: Viking Ships at Sunrise, they had lots of questions. Why did Vikings go on raids? Did they really wear horned helmets? What were Viking ships like? Find out the answers to these questions and more as Jack and Annie track the facts about Vikings. Filled with up-to-date information, photographs, illustrations, and fun tidbits from Jack and Annie, the Magic Tree House Fact Trackers are the perfect way for kids to find out more about the topics they discover in their favorite Magic Tree House adventures. And teachers can use Fact Trackers alongside their Magic Tree House fiction companions to meet Common Core text pairing needs. Subject Vikings -- Juvenile literature. Osborne, Mary Pope. Viking Ships at Sunrise.